Being sick with the flu is the pits! The first week, I basically slept 20 hours a day. The second week, I was awake more, but still spent all day in bed. The third week, I still felt lousy. However, since I felt significantly better than the previous two weeks, I spent Sunday and Monday trying to "catch up. " Wednesday, I spent all day in bed again. I am going to wait until next week before I try anymore "catching up." I have done practically nothing for three weeks. No wonder I am in a funk! I'm lying in bed, listening to the birds chirping, and thinking I mus be imagining things... because it really sounds like the chirping is coming from inside our apartment. Eventually, I am compelled to get up and check it out. Lo and behold, there was a beautiful, black, with a bit of a rainbow tint, humming bird Palestine Sunbird(tzufit eretz yisraelit), perched on our living room light fixture. Instead, I chased the bird out of the window. Physical and Emotional Health -- What's the Connection? Have you ever noticed that it is easier to be upbeat when you are feeling good? Actually, I noticed that my downward mood swings often coincided with my being sick. As I got better, my mood would, inevitably, pick up. Part of this cycle has to do with keeping busy. When I have energy, I am busy doing things. I do not have time to get bogged down by melancholy thoughts. But when I am sick, and lying in bed... boy do those thoughts creep in!! Once they start invading, they are like an avalanche. One thought leads to another until suddenly I am burried under all this... stuff. Then I have to dig my way out, and there is not a lot of air. Until the day comes, when the sun is shining and I am feeling good again. All those heavy thoughts melt away, and I can get back to being myself again. It can be difficult, especially when my mood is grey. But I try to remember that the clouds will eventually part, and I might even see a rainbow along the way. I am in a wonderful support group! I don't wish my situation on anyone, but if you have to live with cancer, it can be really helpful to talk with other people in the same predicament. Our support group is starting a new session, and new members are welcome! The group will be led by a fantastic social worker, who led our group last year. 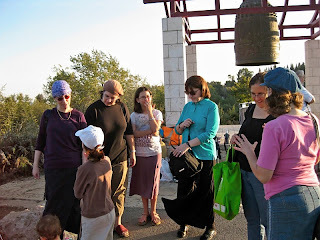 The group is for women only, and meets at Beit Natan. If you, or someone you know, is interested, you can email me, or contact Beit Natan directly. Pease, do not hesitate to join us! I never understood people who listen to loud music. Good music should be savored, not blast your head off. Driving to the hospital for an ultrasound, I could not shake away all my fearful and depressing thoughts. In an effort to drive these thoughts out of my head, I pumped up the volume. There's nothing like a strong beat, to blast those thoughts away. Last night, we were at a Bat Mitzvah celebration where they just served a dairy dessert. At the entrance, there was an ice cream bar where you could get ice cream in a cup, in a sugar cone, or scooped on top of a freshly made waffle! Yumm!!! I took a deep whiff, then passed by to greet the ba'alei hasimcha (celebrants). After hugs and a few words, other people caught their attention, and I went to go stand on line. I actually asked for TWO waffles, both with maple syrup, one with strawbery ice cream, the other with maple ice cream, both topped with white and dark chocolate syrup and sprinkles. I hurried to a table, so I could enjoy the contrast of the hot waffle and the cold ice cream. I wanted more, but my tummy had no room. I knew I would regret it if I took more. The speeches and performances were sweet and meaningful. The dancing (led by Naomi Moss) was super energetic. But the ice cream.... was divine. It was not until I was driving home that I realized - that's all there was. It is not easy living with someone who is living with cancer. Forget all the other obvious issues, someone with cancer is NOT reliable. I might have all the best intentions in the world, but if I am too tired, I am just not going to do what I said I would do. Quite honestly, I am often "too tired." I make a committment to take care of something, or clean something up and then, boom, I am too tired and my committment just flies out of the window. I apologize. And I really am sorry. But, I just cannot do what I promised I would do. And there is no way to be certain that I will do it tomorrow... even if I promise to do my very best. Even taking chemo in pills (at home), I still have to go to the hospital several times a month -- for doctor's visits and blood tests (every 3 weeks) and my bone treatments (once a month). Over time, many of the cancer patients get better and "disappear" back to their "old life," the life without cancer. Sometimes people disappear and I do not know why. Have they simply switched treatment days or....? I am afraid to ask. Afraid to know. Usually, my eldest and I find ourselves having a sachnash late at night, when both of us should be sleeping. But last night, after dinner, we found ourselves hanging out in the kitchen, having a serious sachnash. My daughter was all riled up about a moral dilemma she noticed in Tanach (The Bible). I mostly listened, wishing Moshe would join the conversation and provide some insight to the very real questions our daughter was raising. Finally, Moshe came out of the computer room. He was intrigued by our conversation. Relieved, I told our daughter, "Abba [Dad] can probably help you understand this better." Our daughter took one look at her Abba and jumped out of her seat. "The computer is free! I gotta go!" she exclaimed, and ran out of the room. On Sunday, I did a CT of my head, neck, chest, adbodment, and pelvis. There is no written report yet, but it seems as if everything is ok -- meaning there is nothing new. The CT is done without contrast, however, which means we do not see everything so clearly. The radiologist did see a "hint of something" on my liver. My oncologist does not think it is something to worry about, but he is sending me for tests, just to be sure. I have to do an ultrasound this week. Meanwhile, there are also tumors on my lungs. Apparently they have been there all along. They are tiny, about the size of an "o" but they are there, and there are almost ten of them. I thought the tumors on my lungs were gone. Apparently, the Navelbine (first chemo I took) shrunk them, but did not eliminate them. My oncologist says that tumors shrinking to that size, and staying that size, is practically the same as if they are gone. It does not feel the same to me. "Good as gone" is not "gone." I want the tumors to be gone. I am still sick. I am stuck in that middle ground, where you are too sick to do anything, but not sick enough to sleep all day. I am bored, but not energetic enough to do something about it. I have a mile-long list of things to do and I am too sick to do any of them, but not sick enough not to care. Things have been a little heavy here, so I thought I'd share some more family folklore to lighten things up a bit. This is a TRUE story. One kid asking the other: "What's an idiot?" Answer: "Any driver that isn't Ima." Sometimes I worry that I am whitewashing the cancer experience. After all, I don't want to post every day how tired I feel, how my stomach is upset, how much I hate taking pills/going to the hospital/doing tests, etc. Yet these are feelings I have all the time. It takes constant effort to keep my mood up and my attitude positive. That is so much harder to do when I am sick! Yesterday, things reached an all-time low. Two weeks ago, my oncologist wanted me to do a CT (head, neck, chest, abdomen and pelvis), to get a full picture (more or less) of how I am doing now. I put it off a week, because I did not want to lose family time during Succot. Then, on the day of the CT, I felt too sick (with the flu) to get out of bed. I hoped I would feel better on Sunday (yesterday), and be able to go then. Well, Sunday morning I was still sick and feeling lousy, but I knew that the radiologists review the CTs on Monday morning, so if I did not want to lose another week; I needed to go. I had to fast for this CT (no food, but I could drink water until an hour before the test), so I fasted all morning, in the hopes that I could get an appointment that day. It took a bit of negotiating, but the secretary, who knows me by now (me being a "frequent flyer," and all that), managed to get me an appointment for 2:30. On the way to the hospital, I joked with my friend that the reason they don't let you drink for that last hour is so that you will be so thirsty when you get there that you won't mind drinking the disgusting Barium solution required for abdominal scans. Seriously, between the heat wave and the Xeloda (which makes me thirty all the time), by the time I got to the hospital, I was so desperate to drink, I was actually grateful for the liquid they gave me. Not for long. By the third cup, the drink was no longer the least bit appealing, even with the added lemon-aide syrup. By the sixth cup, I did not know how I would manage to drink any more! I did not understand why it seemed so difficult for some people to finish the solution (besides the disgusting taste, which did not seem to bother others as much as me). Well, with my current lack of appetite, I just did not know how I would manage to squeeze more liquid into my tummy. It took half an hour to drink another two cups. I felt bloated and and nauseas. I felt really, really sorry for myself. I asked again. I know that once, in the past, they called me in when I still had some drink left. Thankfully, they told me that I did not have to finish the last two cups and I would be called in soon. The CT took all of five minutes. I could not wait to get out of there. The ride home was awful. I prayed that I would get home before I needed to either throw up or go to the bathroom. I felt so awful, I could not even fall asleep. Just so you know (and don't worry), I'm better now (though I still have the flu). On Friday morning, I realized I was just not ok. One of the women, who organize the local Chessed ("acts of kindness") group, happened to call me on Friday. When she heard my voice, she immediately asked if she could organize meals for us. It was already mid-morning on a Friday, when Shabbat comes in so early! I hesitated. I would not have dared to call and ask for this. But here she was.... offering it!! "Is it really a possibility?" I asked, giving her a chance to rethink her offer. She assured me that it would be no problem. I knew I should accept. I did not feel well, my energy was still low, Moshe and my son were still sick (and, therefore, useless as far as Shabbat preparations go), my youngest was as school and would likely be tired when she got home (not yet being fully recovered), the house was a disaster, and there would only be so much I could ask of my eldest, the only really healthy person in the house. It would be difficult for someone to make us soup, especially in the quantities that we eat it on Shabbat. "OK," I agreed, but I will make chicken and soup. What a bracha (blessing), not having to worry about anything else!! I went to lie down to rest for a few minutes, to gather my strength. My eldest, God bless her, came home and went straight to work, tidying up what she could. I had thought she might be willing to make the soup and chicken, with a bit of guidance. I was wrong. She was repulsed at the thought of touching dead chickens. I could not blame her. I was her age, when I decided that if the thought of touching dead chickens so repulsed me then I should not eat them. My mother objected to my vegetarian inclinations, but soon after, I became a vegetarian, the way only Jews can be vegetarians ("What? That potato touched a piece of chicken? I cannot eat it now!") Who else in the world refuses to eat vegetables just because they touch a piece of meat?! Clearly, I was not going to traumatize my own daughter by insisting that she make chicken soup! Then, my youngest, God bless her too, volunteered to make it! She was so positive and enthusiastic! But I felt she was still a bit young to do it on her own. "Come," I invited, "I will show you how, so you can do it next time." It was fun cooking with her. I was not in my best form, but she had such a positive attitude that I was able to keep going. When we finished, I still had the daunting task of cleaning off our Shabbat Table -- we had not eaten at the Shabbat Table since Yom Kippur, so it had become quite a repository of... everything, from important medical documents to junk mail! Cleaning the Shabbat Table is the bane of my existence. Once that was done, I was able to rest until the table was set and we were ready to eat. I managed to stay at the table for most of the meal, even though I was finished (in all senses of the word) after the soup. When I went to lie down, it was still early, but I had to lie down. I was sorry to leave my family, who were in a lively discussion about parshat hashavua (the weekly Torah portion). When my son left the table, I invited him to come, sit with me and keep me company. About twenty minutes later, my eldest daughter joined us. Eventually, my youngest joined us as well. It's been a long time since we all lounged around in my bed, joking and hanging out. At one point, Moshe, who must have wondered what happened to all the kids, wandered in. "So, this is where everybody is hiding!" he said, bemused. It was one of those precious moments that you want to engrave in your memory! Shabbat day was pretty slow moving. But it was also filled with good family moments. Oh yeah, and LOTS of sleep!! Well, I just lost a week. On this, one of the busiest weeks of the year, being the week "after the chagim," I did NOTHING but sleep and watch really bad TV. I did not even enjoy the rest! Besides feeling yucky, my muscles hurt so badly, I felt like someone beat me up with a bat! Sleep was my only escape, but the pain kept waking me up. My regular pain killers did not relieve the muscle pain. Even the TV was not such an effective distraction. I wanted to watch funny things (laughing makes you feel better) but everything was either scary, depressing or just BAD. I love having a TV in my bedroom, for when I am sick or too tired to get out of bed. I really want to hook up a DVD, so I can watch what I want, instead of the junk on TV. We even have the DVD, I am just too technologically challenged to hook it up. Moshe can do it, but he has been too busy (working, picking up all the other loose ends, being sick himself, you get the idea...) to get around to it. All this technology, and I just lay there bored out of my mind!! I did not even feel like talking on the phone with friends. I still have not gotten my voice back and I just don't feel like talking! That is how you know I am really sick!! And, obviously, I had no strength even to blog! Anyway, I am feeling a bit better today, but still not that great. Don't get too worried about me. My mood will pick up as soon as I start feeling better. Meanwhile, we have cancelled our Shabbat plans - no guests and no going out. I would not want to infect anyone else! It will be an in-Shabbat for us. And my eldest, the only one who has not yet gotten the flu, will be wearing a mask! Now that I have praised the radiation department in several posts, I feel obligated to share one story that was particularly traumatic. This was a one-time incident, probably because I made sure it was not repeated. Leaving it out, would be white-washing the whole radiation experience. In order to appreciate the magnitude of this incident, it is important to understand some of my limitations. I have very weak stomach muscles -- I have had 6 major abdominal surgeries (3 C/sections, 1 failed hernia repair, 2 abdominal surgeries for reconstruction including additional failed hernia repairs). My stomach muscles were not particularly strong before the surgeries, kal vahomer (even more so) after them! So, sitting up from a prone (lying down on my back) position is difficult, even in the best of circumstances. I either have to hold on to my legs and rock or turn over on my stomach and rise from that position. Neither is particularly graceful, and I need room to maneuver, to make sure I don't fall. I share these private details, so you will understand what happened and how humiliating it was for me and how important it is for a patient to stand up for his/her dignity. During radiation, the patient lies down on a narrow platform. The technicians help you lie down in the correct position, and do their best to make you comfortable. They lay a clean sheet for you (re-using "your" sheet, every time); they will place a cushion under your knees, to relieve stress on your back; and, of course, they make sure to line you up so that the radiation is aimed correctly. As patients, we are primarily passive -- adjusting the way we lay down, according to how the technicians direct us; then holding still, while the machine does its work; then we get up and go. Except, for me, I need a little help getting back up. Most days, this was not a problem. I asked the technician to give me a hand -- I just needed a little steady leverage to help me sit up. Now, so we are clear, I did not need someone to pull me up. My stomach muscles work, they are just weak. I just needed someone to hold my hand and "spot" me as I pulled myself up. I did most of the work, they just supported me, helping me stay steady, so I did not lose my balance. After the first few times I asked, the technicians knew to come right away to help. The whole thing took all of 15 seconds. Then, sometime in the middle of my treatment, one of the technicians refused to help me up. At first, I could not understand why he was not coming to help me. So, I asked again for his help. “Get up yourself,” he told me. I was a bit taken aback, but I explained again that I need a little help getting up. “Get up, the way you get out of bed,” he instructed me again. Now, just to remind you, this conversation is going on while I lie on my back, powerless to get up, feeling helpless and humiliated. I repeat that I just need a hand to brace against while I pull myself up. “If I help everyone, it will damage my back,” he said. “So, please get someone else to help me,” I plead, wondering how long I will be stuck lying there, while this technician not only refuses to help me, but also refuses to ask someone else to come in and help me. I feel completely powerless. Finally, one of the other technicians enters the room. She has no idea how long I have been lying there, but comes right away to help me sit up. I go to the small dressing room to put on a scarf, over my already bald head. I gather my things and walk out. For the first time, I do not say "thank you" as I leave. I am humiliated and want to cry. On my way out, I see one of the other technicians, who has always been very friendly and helpful. I take a few deep breaths, then describe to her what happened and ask that I be helped by other technicians in the future. She understands and promises to take care of it. For several days following this incident, I worried about a repeat scenario. I made sure to request that certain technicians come in afterwards to help me. Thankfully, the situation did not repeat itself. I was very shaken by the experience. I had to remind myself that there is no reason to be embarrassed about needing help. The shame is on the technician who made a patient (me) literally beg for assistance. It was not easy for me to share the experience with the other technician, which meant revealing how dependent, and helpless, I found myself. I am proud that I had the nerve to say something and make sure that I would not find myself again in such a helpless position. I did what was necessary to protect myself in the future. Sleep had always been one of my blessings, at least for the last twenty years or so. I can sleep any time, any where. And I sleep deeply. Nothing wakes me up! When my kids were little, they learned the hard way that when they wake me up, I will say anything (including utter nonsense) to make them go away so I can get back to sleep. And I will not remember what I said, or even that we had a conversation! But lately, I have had a tougher time falling asleep. Part of it might be the afternoon naps, but I doubt it. They never disrupted my sleep before. Part of it might be the constant pain. Though I am taking more pain killers, and my back definitely hurts less when I am lying down. I suspect there is something else going on, but I am not sure what it is yet. I had to delay my afternoon nap in order to pick up my son from school. He was actually ready to take the bus home, but I had enough energy to pick him up, and he did have a fever. On the way home, he revealed that he did not sleep well last night and woke up at 3:00 am, without being able to fall back asleep. He insisted he was not tired, but went straight to bed as soon as we got home. I'm going to take a nap too. I got the flu shot yesterday.... I hope it's not too late! The doctor on call thinks it might be "swine flu." The doctor thinks my daughter is past the worst, and getting better. Still, he wants me to wear a mask around my daughter and my husband. That just seems insane to me! Moshe wants me to do it. Am I supposed to sleep with a mask??? Though we have lived in Homat Shmuel for 4 1/2 years, I still feel like I am "coming home" when I spend Shabbat in Katamon/Baka. When I walked into Shir Hadash (our previous shul) at night, I received such a warm greeting. It was so wonderful to see so many friends, and receive so many hugs!! At one point in the evening, it was fascinating to find myself leading dancing, especially when there are so many younger, more energetic women than I! It is nice to know that I still have something to contribute -- my energy may be down, but my ruach (spirit) is as strong as ever! In the morning, I had the same experience, magnified sevenfold! The moment I walked into Shirat Sarah (my women's tefillah group), I felt embraced by love and caring. The walk to shul (synagogue) had been harder than I expected. In addition to the heat, and my general difficulty walking, my stomach was upset. I realized I forgot to bring Imodium, and prayed that my stomach would not get worse before I got there! When I finally arrived at the building, I discovered that the Shabbat elevator was not working and I had to walk up the three extra-long flights. I went straight into the ladies room. When I washed up, I saw that my face was flushed. I splashed some cool water onto my face; then I walked into the shul and practically collapsed into a chair. I had not thought I looked that bad, but several women rushed to fan me and make sure I had something to drink. I wasn't sure whether to be embarrassed or grateful. I chose to be be gracious, and expressed my appreciation for their attentions (while, at the same time, assuring them that I was ok). To my pleasant surprise, I was not nearly as late as I feared. I rested a bit, then joined the hakafot. I did not sing, as I was saving my voice for the Torah reading. It was disappointing to me that I would not be reading the aliyot for V'Zot HaB'racha, but I knew that I could not strain my voice that much. I felt relieved when a friend of mine, who is also diligent about reading well, agreed to read in my stead. I was still quite involved, checking the reading and assisting the gabbait, by lining up the women for their aliyot (more complicated than it might seem, since several women had prepared specific aliyot in advance -- but I have been doing this for several years, so I have it more or less under control). I even remembered to have someone switch me in the middle, so I could grab something for kiddush. In previous years, I always stayed to the end. By the time I realized that I also needed to make kiddush, I consistently ended up missing the reading of the end of the Torah. Since I would be reading that aliyah, I could not very well miss it this year! I found the strength to read the aliyah loudly and clearly. I felt very emotional about the aliyah, both because of the content and because I have wanted to read this particular aliyah for so long. If I do say so myself, I did a good job. It was such a privilege! We were not a large crowd this year, so I ended up receiving several other honors, such as hagbah (I volunteered to lift the smallest Sefer Torah!). I also opened the Aron Kodesh before Tefillat HaGeshem (the special prayer for rain). These might not seem like such a big deal, but they are considered honors in shul, and I do not take that lightly. It does not bother me not to receive any honors, but I still appreciate them when I get them! The overall atmosphere was that of warmth and inclusion, not just to me, but to all who were present. That is what makes this tefillah group so amazingly special. Also, thought I have not been a regular at the tefillah since we moved, I knew almost all of the women there. More than that, I felt close to most of the women. Everyone greeted me with such love and affection, I felt like I had come home from a long journey. Simchat Torah -- the way I want it? warning: long post -- too much work to break it up into two posts! We were planning to go away for Simchat Torah. We always go to Katamon/Baka for Simchat Torah, because that is where I know I will be able to celebrate the way I want (without having to make a fuss!). I like going to Shir Hadash at night, where the women dance with a Sefer Torah for all the hakafot (rounds of dancing) and there is good ruach (spirit) and energetic dancing for women. In the morning, I love to go to my women's tefillah group, Shirat Sarah, which has a really unique davening (prayer service) and also a lot of ruach. I am not a particularly spiritual person. I am much more of a rationalist, and rather conservative about the way I like to daven (pray). But I have come to appreciate the creative outlet that Simchat Torah provides for the women in our women's tefillah community. Out of the seven hakafot, about half are "traditional" and the other half are "alternative" -- sometimes the woman leading the hakafah will teach a song, or give a small vort (telling a d'var torah or sharing a parable), or sometimes she will even do some sort of new-agey meditation or excersize. I am not really into the new-agey stuff, but I can tolerate it once a year. It clearly appeals to some women, so it is nice for them to have an opportunity to express that side of their religiousity from within the community. When I am there, I am quite active. I read "v'zot hab'racha" every year and I have led one of the the traditional hakafot for several years now. This year, I was honored to be asked if I had ever been Kallat Torah or Kallat B'reishit. I did have the honor, several years ago, of Kallat B'reishit, so I declined the honor. It was immeasurably powerful to read the beginning of B'reishit. Since then, it has been my desire to also read the final p'sukim of the Torah. This year's Kallat Torah is not interested in reading, so I am scheduled to read for her! I do not particularly desire the honor of the aliyah, I am just so excited to finally be reading the the final p'sukim of the Torah!! In my current, heightened state of emotions, it is difficult for me to read that passage without crying. After all he has done for God and for the Jewish people, in order to bring them to the Land of Israel, "you will not go there" are the last words that Moshe hears before he dies, there, on that spot, overlooking the land he so desperately wanted to enter. I hope (and pray) I can do the reading justice. I feel so torn over this Simchat Torah. My voice has not yet fully returned, making practicing very difficult. In addition to being diligent about reading the words and notes correctly, it is important to me to read loudly and clearly. When I read, I really feel like I am transmitting the word of God; that should be done with a certain amount of strength and power. My normally booming voice is still not strong. I am praying that I will read the aliyah well. It is more important to me than anything else that I am planning to do at the tefillah. My daughter still had a high fever (103 F / 39.4 C) last night. Because of the whole swine flu thing, the doctor on call recommended that we do not take her out until she has been at least 24 hours without a fever. Moshe knows how important Simchat Torah is to me, and is encouraging me to go with our son, while he stays home with our daughter. But then our whole family will be all over the place. As is, my eldest is going to K'far Yonah, with her youth group, to spread the joy of Torah (Simchat Torah) to the community there. This will be the second year that she is not with us for Simchat Torah. After last year, I hoped she might choose to rejoin me. Apparently, making other people happy is more important to her than dancing with a Sefer Torah. I am proud that she is so giving, though I will still miss her. If I stick with our original plan, my husband will stay home with our youngest daughter (added bummer: I have to cook, even though I am going away! ), and our son will sleep at his friend's home, where we are invited for lunch. It will be more comfortable for my son to attend shul with his friend and his friend's father, rather than with me or my/our host, who he does not know so well. I wish we were not spread out like this. I wonder if this is all a sign that we should just stay home. But I do not really believe in "signs." And I know that I would just be so disappointed (and probably frustrated) about missing Simchat Torah the way I want it. I am way past the stage of "fighting" for a Sefer Torah, or being the main motivator for women's dancing and singing. I did that for years. Now, I just want to come and participate and enjoy the chag (holiday). I can do that if I go where I always go. So, I am going. Even if it means going on my own. At least I will be with good friends. And I will be with my son for lunch. It will be a mixed experience. Not quite as happy, without my family. I am grateful for my husband's understanding and encouragement. I would not do this on my own otherwise. As I am constantly emphasizing to my kids, holidays are family time. update: I just spoke with my family doctor. Aliza's fever was down this morning, below 100. He thinks she should avoid shul tonight, but could be a guest, even for all of Shabbat, as long as our hosts are comfortable with it. We might be together, after all! On Thursday, we planned to go to Hareisha for a fun family day with all our cousins. Moshe's sister and her family moved to Hareisha after they were kicked out of their home in Gush Katif. They chose their new community first and foremost because of the local Zilberman School that most closely replicated the kids' previous school. It took only a short visit for my sister and brother in law (SIL & BIL) to realize they felt at home in Hareisha, and it was mutual. The Hareisha acceptance committee convened immediately, to accept them and the entire community welcomed them with open arms. When my SIL and her family returned from purchasing a few groceries, they found a fully furnished caravan waiting for them! Members of the community had provided beds, sheets, tables, chairs, toys, an oven and even a refrigerator! To their surprise and joy, my SIL and her family had everything they needed until they were able to retrieve their own belongings from storage. Thank God, they had found their new home. We were amazed by the warmth and generosity of their new community! Hareisha is a beautiful community, on top of one of the tallest mountains in Binyamin (the area north of Jerusalem). From their mountain top, you can see the entire coast of Israel, from Hadera all the way down to Ashkelon. You also have a bird's eye view of the airport and all the planes that are taking off and landing. Hareisha is a small yishuv (settlement/community), with almost 40 families, located just above Talmon. Hareisha is built on State owned “surveyed land” (admot seker), meaning the ownership of the land is uncontested; there is no record of ANY previous owner of ANY of the land. Despite their strategic importance and legal residence, this is one of the "ma'achazim" (outposts) that the government is constantly threatening to destroy. There is currently a major legal battle over several permanent houses that are slated for destruction. Since the land here is not under dispute, the legal basis for the destruction of the houses is that one of their building permits was not approved. Recently, there have been similar cases, involving several large housing units in other towns. The government prevented the destruction of these buildings (totaling approximately 55,000 units!) by retroactively approving their building permits. The residents of Hareisha are demanding the same legal treatment. On the surface, both cases are the same. What is the difference? The illegal-turned-legal units were built in Arab & Beduin neighborhoods/towns, while the 8 homes under dispute were built in a Jewish town. The residents hope to bring to light the unequal treatment under the law and force the government to treat Jews and Arabs equally under the law. As part of their effort to raise awareness about Hareisha, Hareisha hosted a wonderful festival on Thursday. The regional council provided transportation from throughout the country and hundreds of tourists visited the area! There were organized hikes, mitnapchim (inflatable climbing/jumping apparatuses), live music, and more! It seemed fortuitous that we had scheduled our family day for that day! Unfortunately, on Thursday morning, our youngest was still running a high fever. Moshe graciously offered to stay home with her, but that did not make sense to me. I am generally tired and I lost my voice and this is Moshe's side of the family. Moreover, I knew Moshe would have more energy to do things (like a small hike) with the kids. Of course, if I were there, I would do it too. But, honestly, hiking is a bit challenging these days and I am inclined to rest whenever possible. Both my daughter and I felt very disappointed. Neither of us wanted to miss spending the time with our family. Unfortunately, there really was no alternative. Moshe worried about my feelings of missing out, but I knew this was the right choice for our family. After Moshe and the kids left, I insisted that my youngest go back to sleep. She insisted that she was not tired... then fell asleep within minutes of going to bed. Of couse, I slept too. 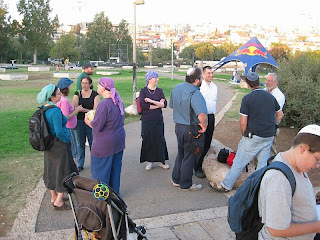 Tuesday, we went to a 'fun day' sponsored by Jeremy's Circle, at Ya'ar B'reishit, in Tel Aviv's Park HaYarkon. They have all sorts of cool outdoor activities there, including rope bridges, an Omega, and a climbing wall. My son and youngest daughter are monkeys! They both climbed all the way to the top!! (Apparently, they did not inherent my fear of heights!) I would have loved to participate in the activities, but they were only for kids. Although my eldest could have participated, she spent most of the time taking pictures. So unfair! Wednesday, we went on a bus tour of the Shomron. 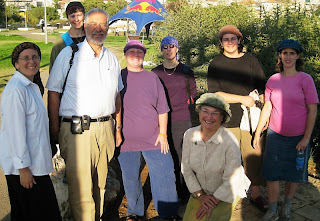 At Yitzhar, I recognized one of the two young men who run the organic winery -- he's a cousin of Moshe's!! We tasted three wines: Merlot, Cabernet Sauvignon, and Puah (a blend of the two wines). Both my son and I enjoyed the wines, but we are the only ones in our family to appreciate dry wine. Then we visited Chavat Alumot (050-4407311), one of the "hill-top settlements" of Itamar and received a tour from ?? Meshulami (I forget her first name), who runs the farm, and manages their cheese and yoghurt production. The Meshulami family also opened their home and succah to us, which we greatly appreciated. On the way out of Itamar, my youngest, who started running a fever, needed to 'use the facilities.' The bus driver showed us where to walk to the shul (synagogue), but I just stopped at the first house with kids playing outside and asked to speak to their parents. We were invited in and treated with warmth and hospitality. When we declined their offer of food or drink, they invited us to come another time. On the way out, Moshe turned to me and asked "Do you know who that man is?" He was so kind and friendly, I never would have imagined he was someone so important. It turns out, we had walked into the home of the Chief Rabbi of the Israeli Army! Devra, Ruti, Yisrael, RivkA, Mrs. S, Klara, Toby, and Robin. I must admit that I arrived about an hour late, along with four or five other bloggers (and their families). We did not plan it that way, but it was kind of funny how we all arrived at the same time! It was great to just hang out! We were 14-15 bloggers (one young guy came and went pretty quickly; apparently he intends to start a blog, but hasn't yet). Most of us came with our families (or some portion thereof). So, in the end, we were quite a respectable crowd. We (the pseudo adults) hung out, while the kids played frisbee, jai alai (remember that game? ), and even flew a kite (with help from Mr. Shiputzim)!! We had a really great afternoon! And we did stay a bit longer than planned... 'cause we were having fun!! OK, so I know y'all are wondering who came. And I do apologize for not getting around to posting a preview list of bloggers. Hope you will join us next time!! Are We Even Going to Use It? Want to hang out on Succot -- Join us Monday and Wednesday!! See here! For the first time EVER, Moshe agreed to put our succah up early. So early, in fact, that even when he had to delay it by a week, he was STILL early!! Now, for those who do not know us well, we are normally still putting up our succah just minutes before Yom Tov! (The succah must be completed before the holiday begins) There was even one year when we were so close to the last minute that, if I remember correctly, we did not have time left to put up decorations! So, when Moshe and my son put up the frame on Friday afternoon, 3 days before Yom Kippur, I was so happy!! That same motzei Shabbat (Saturday night), they put on the s'chach! Now, in our neighborhood, putting on the s'chach is a big deal! The winds here are extremely strong. If you don't fasten your succah well, you might not find it there in the morning! So, it took them plenty of time, and LOTS of azikonim (plastic 'zip ties', that are used in Israel for everything)!! But they did it!! Did I mention that it made me SO HAPPY!! Technically, once the s'chach is up, our succah is kosher. It is built on our mirpeset (balcony), which has 3 walls and a ma'akeh (railing) that is high enough to count as a fourth wall (you only need 2 1/2 walls, so we have more than enough!). I suggested we leave the succah open, but Moshe wanted the walls, so he put those up with our son this Friday, erev Chag (before the Holiday). Then the girls hung our pine cone decorations and -- done! Though clearly proud of his handiwork, Moshe asked me (not for the first time), "Will we even use it?" I understood his query, after all, we spent Yom Tov with my sister in law in Hareisha (my in-laws were there too). And we are going all over the place, during the week. "Of course we will use it!" I reassured Moshe. When we have a succah, we eat everything in the succah! And we will be home for several meals and at least some snack times! Last night, when we returned home after Shabbat/Yom Tov, I planned to go straight to bed. My youngest had other plans. Cheerily, she starting schlepping sheets and a mattress out to the succah. It was after 10:00 pm and she had a tiyul the next day! But she was determined to sleep in the succah. So, I offered to join her and she made a bed for me too! She was correct. My daughter, who gets her internal thermometer from Moshe, slept soundly next to me, in her summer nightgown, covered in a light sheet. Tucked under a blanket, wearing my comfy knitted hat and thermal PJs, I was snug as a bug in a rug! This morning, my son noticed the mattresses in the succah. "Hey," he protested, "I also want to sleep in the succah!" We are certainly using out succah! I have been feeling so tired lately, but I do not know if it is from the new chemo or still from the radiation. By this point, I suspect it is the chemo. For the past few weeks, I have also had an increase in pain, particularly in my lower rib-cage. My oncologist just gave me a referral for a full CT: head, neck, chest, hips and pelvis. He wanted me to do it this week, but that is just too much for me. We have plans every day, and I just do not have the strength to spend a few hours in the hospital for a CT. So, we compromised (read: he gave in) and I will have the CT after Succot. Meanwhile, for the past few days, I have been feeling some pressure (tightening) in my chest, around my sternum. It is probably just heartburn, but it is uncomfortable. I am going to check it out tomorrow. Here are two opportunities coming up this succot! 1. Bloggers Picnic (Monday) -- Though I have a personal preference for the "other" park (which I am not mentioning, lest someone get confused and show up at the "wrong" park!! ), we are gathering in Gan Sacher, 'cause there will be a succah, between 2:30 to 6:30 pm (maybe longer). For more details, read this post. To register, go here - you do not have to register, but it is fun! I'll post a list of bloggers who have registered on Sunday. The tiyul will be from 8:00 to 8:00 -- it will be easy and fun! Appropriate for all ages and abilities. For more details, read this post. Registration is MANDATORY. Emailing me or commenting that you are interested is NOT enough. To register, go here.